What we see of the starting world of Ord Mantell, in game, is merely a fraction of what exists on the planet. 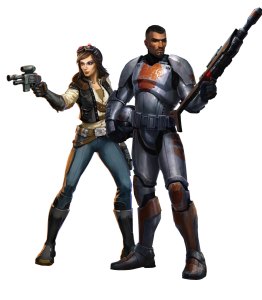 A world dominated by mountains, plains, and oceans, this planet has played some significance to the scope of galactic events for some time, in Star Wars: The Old Republic and throughout the Expanded Universe of George Lucas’ creation. A terrestrial planet, Ord Mantell was settled by Corellian colonists around 12,000 BBY. Located in the Bright Jewel Cluster of the Mid Rim territories, this world has gone from being a “shining jewel” of the area to a haven for the underworld since it’s founding. 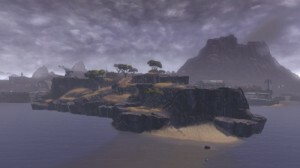 Ord Mantell has vast oceans populated with volcanic island chains. On the main land masses, the geography is mostly mountains and plains. From space, Ord Mantell is said to possess a pink hue due to it’s thick, cometary cloud. The planet has two sizable moons with thirteen other natural satellites. This isn’t really depicted in the game, but has been thoroughly conceptualized by other sources of Star Wars canon. As far as history goes, Ord Mantell was settled and set up as primarily a rural, agricultural world by it’s Corellian settlers. It also has some strategic significance as a munitions supply point for the Republic military during the days prior to the Galactic Civil War. Thus the name, Ord, referring to Ordinance, or weapons. 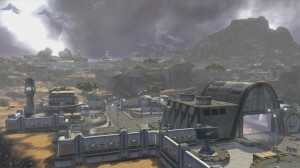 Due to the beauty of the world and the system, Ord Mantell would become a hotspot for tourism within the Republic. It’s said that the main coastline of the continent Worlport boasted many resorts and casinos to help support the tourism. After the Treaty of Coruscant, Ord Mantell began a decline from which it would never recover. While the main government of the planet stayed loyal to the Republic, there were those that opposed remaining part of the galactic organization. Also, the local government was ripe with corruption. The local Admiralty sold off the defense fleet leaving the planet pretty much defenseless, setting the stage for lawlessness and the perfect site for the dregs of the galaxy. Murderers, smugglers, outlaws, and thugs found Ord Mantell to be a great refuge from more civilized systems. Not only that, you have a group of Mantellian citizens that want out from under the Republic’s corrupt control. Boom… the scene is ripe for a civil war. On the outside, looking at the civil war that sparks off between the separatists and Republic forces, one could say that an oppressive government (the Republic) stepped in to bring tyrannical control back to the oppressed people. Or, one could say that the Republic has finally taken notice of the strife that is occurring on this world and has stepped in to defend the citizens of the Republic. It all depends on your point of view and how you choose to interact with the storylines that a player follows on the planet. The starting zone for the Smuggler and Trooper classes of the Republic, Ord Mantell casts a player of these classes right in the middle of this civil war. Throughout the whole arc of the storylines on this starting world, you see a fair amount of wartime atrocities, perpetrated by both sides. The Separatists and the Republic both have shown some “shining” examples of war crimes. Kidnapping, robbery, murder… This is definitely a great spot for a vacation. Suddenly, Korriban is looking pretty good. So, you, as either a Trooper for the Republic Military’s Specforce Havoc Squad or an independent Smuggler with no qualms about bending the rules, have to make your way through your opening levels in this hellish environment. Your morals better be in check because you are going to either have to be a selfish monster or “Robin Hood”. If you really take time to analyze it, Ord Mantell is the perfect breeding ground for a severe case of PTSD. There’s military disregard for the rights and lives of citizens, torture and brutality of suspected war criminals, and don’t forget illegal betting on whether someone gets blown up or not. In a virtual environment, this is fine. But in real life, this could be closely related to what some individuals have experienced in war zones all over our own planet. At the end of your storylines, you put a dent into the Separatists and their efforts, but you don’t necessarily stop the war. I’m kind of up in the air about if my smuggler made a difference, overall, on the planet. Sure, I took out some prominent figure-heads, but was that enough? Was I a hero that took from those who didn’t need it and gave it back to those who did? Or was I just out to make a credit and fend for myself? This is, in essence, the way that the Smuggler storyline goes. I apologize if I’m biased about it and disregard the Trooper side. With the Trooper, I felt more obligated to being the good guy, which lowered my entertainment. I’m just more of a scoundrel at heart. Your main quest hubs areFort Garnik and Oradam Village. These two locations will lead you to almost all of your other quests for both the Trooper and Smuggler. Fort Garnik, while appearing to be strictly a military base, is the center of the zone you quest in. All of your trainers and vendors are here. With Garnik as the central hub, I felt like I did a LOT of running in this zone, even with the public speeders available. I found that I really enjoyed blasting through the Separatists’ volcano base at the end of the storylines. It’s a very 1980’s action movie-style rampage of going into the bad guy’s base to “save the day”, if you will. Lots of loot and lots of carnage. For those Republic faction players who have a bad case of alta-holism, you will find that when you leave Coruscant on a Jedi Knight, your first mission is to silence a Sith Empire listening post on Ord Mantell. This is clear evidence that the Imperials are breaking the Treaty of Coruscant by having a hidden operation on a Republic world.